Always Planning and Never Implementing? How to Get Unstuck! Rather watch or listen than read? Scroll down to watch on video! I couldn't wait to buy a house so I could throw an epic housewarming party! When we finally were closing on a house, I had all of the details planned out in my head... party theme, invitation design, guest list, food and drinks. Yet, when we finally closed, I never threw the party! What happened? When it comes to business, there are a lot of things that can keep us stuck in the planning phase and never taking action. But, unlike a housewarming party, there are consequences to never implementing. When you continually plan, plan, plan, you waste a lot of time that could be spent actually working on the project; and by never launching, you're missing out so much potential income! Miss the first post in this series? Read about the 7 setbacks keeping you from success. A business friend of mine had been procrastinating on adding a tripwire to her sales funnel for 8 months. She finally implemented a $13 tripwire and has started to bring in an extra $1500 a month from it! She missed out on $12,000 over the last 8 months by not implementing!!! You need to decide what's a priority. If my friend had known exactly how much passive income she could've been bringing in every month by adding a tripwire, I'm sure she would've taken care of it much sooner. Instead, she prioritized other things that took up her time. Rather than trying to fit in this project between other tasks, set aside intentional time on your calendar. My favorite way is to take a Bosscation — a few days away from your daily distractions to focus and plan! That way, you can gain momentum and really get through the implementation. Perhaps you have a ton of ideas, but can't decide the best one to move forward with, so you semi plan out all of them... or don't plan out any of them! You need to make a decision on who you're building it for, or what exactly you're offering, and move forward so you don't get stuck for months. Build out your foundation. Decide what you’re offering, who you’re offering it to, how you’ll be delivering it, etc. Don’t forget about pricing and marketing. Need help making a decision? Be sure to download our free decision-making workbook here! When you have too many things on your to-do list, it can be easiest to just freeze up and never get started. Map out the major, highest priority tasks. Then break those down into bite-sized pieces that are easy to tackle. That way you can make traction and feel like you're actually accomplishing things. If I had sent out the invitations for my housewarming party, I would've been forced to take action with the food, drinks, and decorations. So often, business owners never set a date because they're afraid of not being ready in time. However, by setting a deadline, you'll then have an incentive to get things done and will learn how to prioritize your tasks. Look over your to-do list to determine how long you’ll need before launching. Add an extra week or two in there as wiggle room and then… here’s the scary part… publicly announce your date! Let me know in the comments below what you're looking to launch, and when, so I can keep you accountable! Feeling overwhelmed? No longer love what you do? 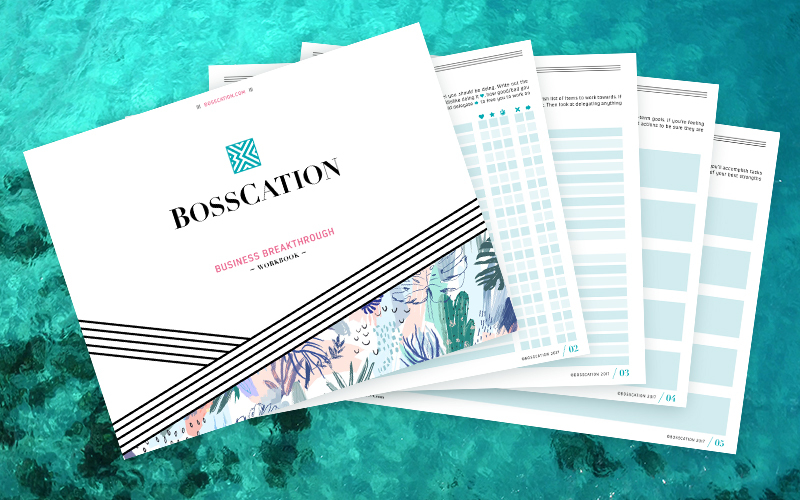 Our free Business Breakthrough Workbookwill help you ditch the overwhelm and determine your best course of action.